Taking another major stride toward its digital inclusion and ecosystem development goals, Telenor Pakistan officially launched its 4G services along with new range of Telenor-branded 4G smartphones and 4G mobile broadband devices today at a dynamic launch event. 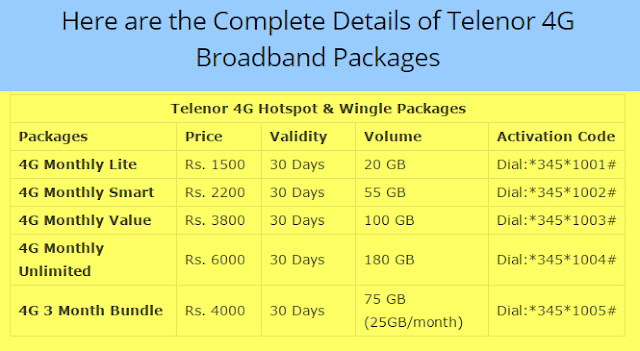 Telenor Pakistan won the technology-neutral 850 MHz spectrum license earlier this year and announced the launch of best-in-class 4G services in August 2016. The launch of 4G services is in pursuit of Telenor’s ‘Internet for All’ motto, a promise that the company has kept through numerous initiatives aimed at developing and promoting digital ecosystem in the country. For increased mobile broadband penetration and adoption to newer technology, Telenor Pakistan has also maintained its own hardware portfolio that comprises an affordable range of 3G, and now 4G, handsets and internet devices. Today, that portfolio got a powerful upgrade with the new ‘Infinity’ handsets, and 4G mobile broadband devices. 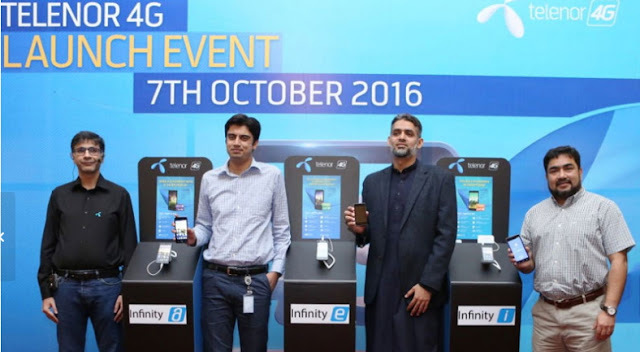 The new range of handsets that Telenor unveiled at the ceremony is called ‘Infinity’ and comes in three models i.e. ‘Infinity a’, ‘Infinity e’ and ‘Infinity i’. All three handsets are powerful 4G enabled devices featuring Android Marshmallow 6.0 OS, stunning IPS display, powerful quad core processor, reliable memory, advanced front and back cameras, and long lasting battery. The handsets fall in the affordable ranges of PKR13,000, 9,500 and 7,500 respectively, and come with three months of free voice and data bundles along with 12 months warranty for all customers. 4G mobile broadband devices launched at the event include 4G HotspotWingle and 4G Hotspot Mobile Wi-Fi. Both devices deliver blazing fast 4G speeds with 3G and 2G fall back options. The 4G Hotspot Winglecan connect up to 10, while 4G Hotspot Mobile Wi-Fi can connect upto 16 devices respectively including smartphones, tablets, laptops, smart watches, LEDs etc. The cost is only PKR 2,000 for 4G HotspotWingleand 3,000 for 4G Hotspot Mobile Wi-Fi. “We are already Pakistan’s favorite digital lifestyle partner and the launch of best-in-class 4G services will help us deliver even better services to our customers,” said Bilal Kazmi, Chief Marketing Officer, Telenor Pakistan while commenting on the development. “We are not here just for business; we are here to change lives and empower the Pakistani society through digital inclusion, a domain where our goals converge with those of the Government of Pakistan. Having the country’s largest 3G network in terms of geographical coverage, we are now geared for a comprehensive 4G rollout so our customers experience mobile broadband like they have never experienced before,” he added. Bilal Kazmi further highlighted that affordability of compatible hardware is as crucial to mobile broadband penetration as the service itself. “That is the reason why we have developed our own devices portfolio that comprises affordable 3G/4G handsets and 4G mobile broadband devices. Today, the portfolio saw a robust upgrade with the addition of the ‘Infinity’ series smartphones and new 4G Hotspot Wingle & Mobile Wi-Fi. As has been the tradition, we will continue to upgrade our hardware portfolio with more affordable and advanced devices,” he explained. With impressive digital goals, and a number of initiatives to prove the company’s serious commitment to achieving them, Telenor Pakistan has been leading the current ICT-powered digital revolution. The company has also been a major contributor to Pakistan’s socioeconomic development and continues to play a major role in helping the Government of Pakistan achieve its long-term digital and financial inclusion goals. The acquisition of 4G license and roll out of next-generation mobile data services will herald a new era in ensuring digital inclusion of the masses and empowerment of the Pakistani society.